388 Bridge Street, #44-H, Brooklyn, NY, New York 11201. 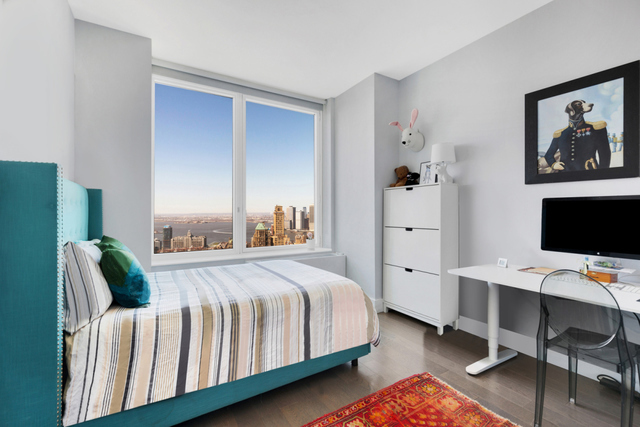 Spacious and bright, this sky-high two bedroom two bath home offers northwest exposures for sweeping views from every room, including the Empire State Building, One World Trade Center, the Statue of Liberty, and the New York Harbor. 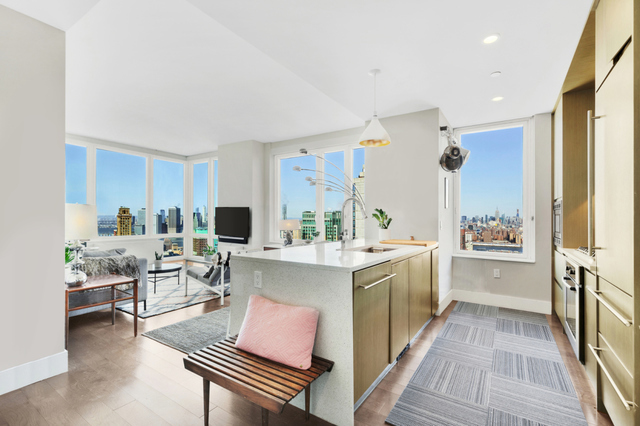 With walls of sixteen windows throughout and ceilings over ten feet high, this light-filled residence features wide-plank oak floors, and designer hardware and fixtures. Clean lines and a thoughtful blend of natural surfaces form a tranquil living space. 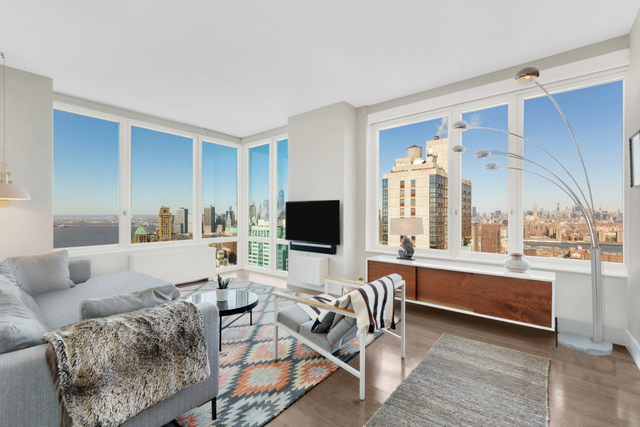 As you enter this residence, the kitchen window perfectly frames a stunning view of the Midtown Manhattan skyline. The spacious foyer opens up to the gourmet kitchen with a large peninsula offering built-in breakfast with room for four stools. This kitchen is outfitted to an exceedingly high standard with premium appliances and touches - a Liebherr refrigerator, Viking gas cooktop, and Bosch convection wall oven, microwave, and dishwasher - that are elegantly complemented by the white quartz countertops and backsplash, and warm gray walnut cabinetry with under-mount lighting. 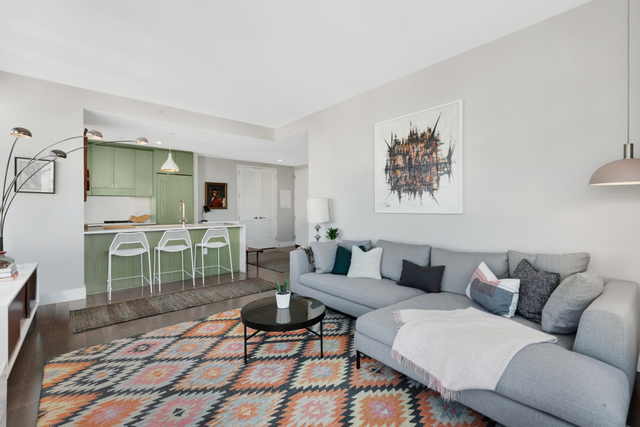 From the corner living room you can entertain while enjoying the amazing city skyline and harbor views through the backdrop of mesmerizing sunsets. The dining space, framed by three large windows, is large enough to accommodate a full dining table. The open master bedroom offers double exposure creating an oasis feeling with maximum privacy from the rest of the home. Ample closet space is available with a customized walk-in closet. 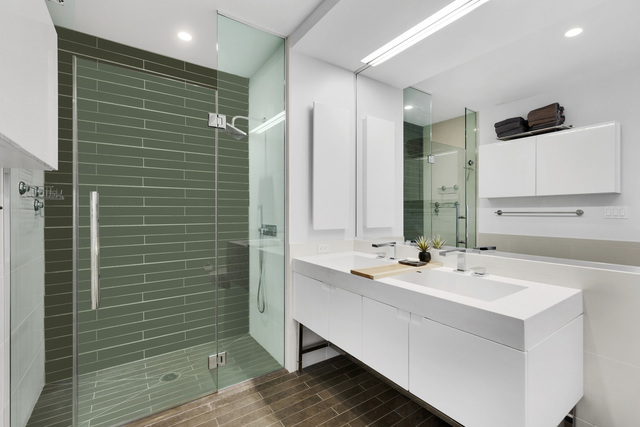 The luxurious master bathroom premiers a walk-in shower, white Quartz walls and Lagos Azul limestone floors and shower walls, a dual cast sink with ample storage underneath and a white lacquer medicine cabinet. 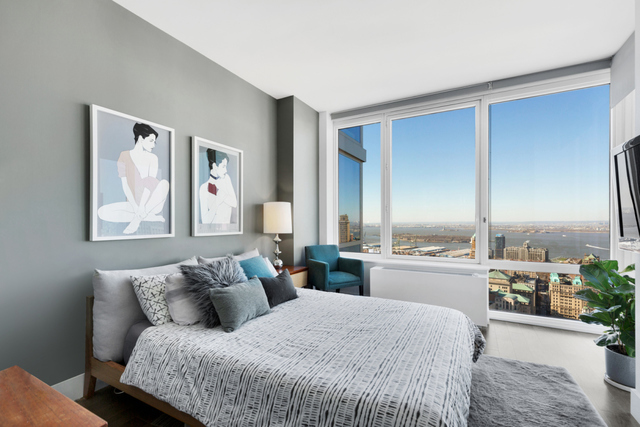 The west facing spare bedroom offers excellent harbor views and a very large closet. 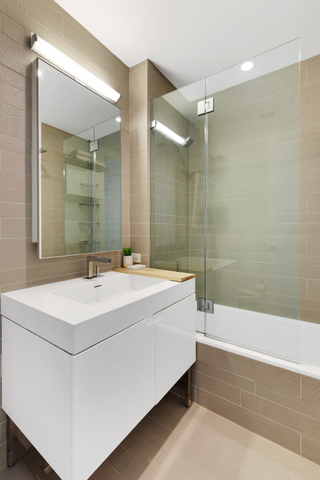 The adjacent second bathroom has a bathtub, a white cast sink with storage and a large mirrored medicine cabinet. Finally, the entry foyer provides a coat closet and a Bosch washer/dryer with additional shelving. This property is offered inclusive of a storage unit located in the building cellar. 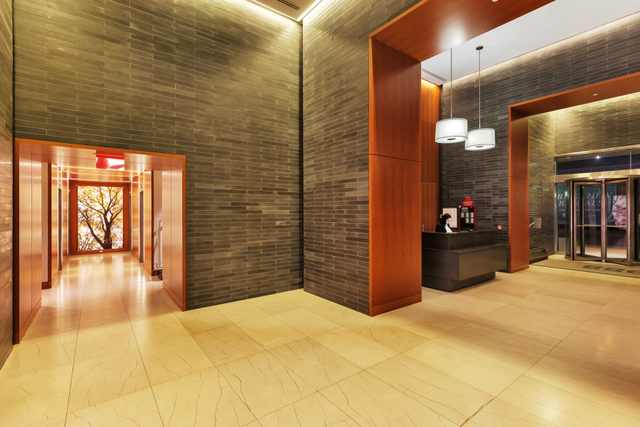 - Grand, fully-attended lobby with 24-hour doorman and concierge. - Live-in super and full building support staff. 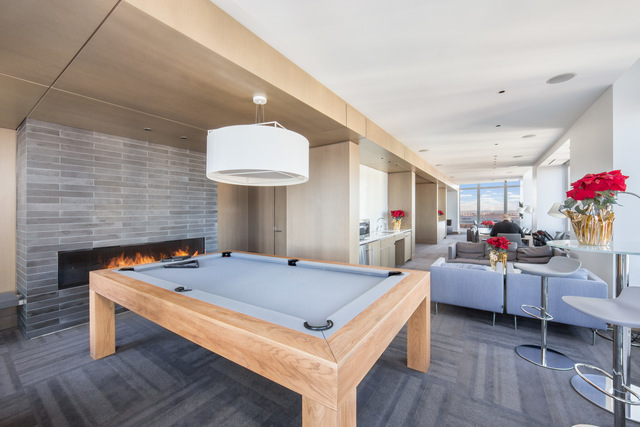 - Sky Lounge with a billiard table and fireplace. - Rooftop viewing terrace with seating and barbecue grills. - State of the art gym. - Party room with separate pantry and service kitchenette. - Work/Office room overlooking the children's playroom. 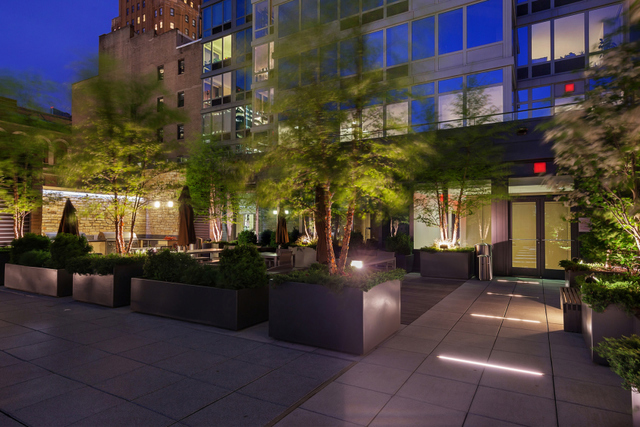 - An expansive fifth floor terrace with barbecue grills and an outdoor children's play area. 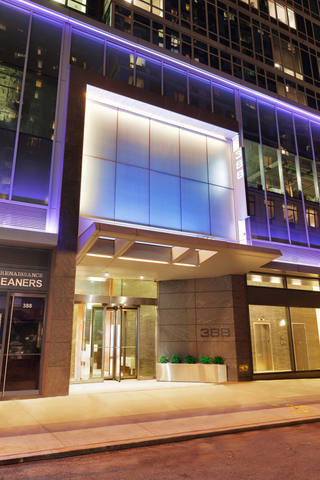 - Optional amenities: on-site parking accessible through the lobby and the Manhattan Athletic Club gym. The building is located two blocks from City Point with Trader Joe's, Alamo Drafthouse Cinemas, Century 21, City Target, and the DeKalb Market Hall. 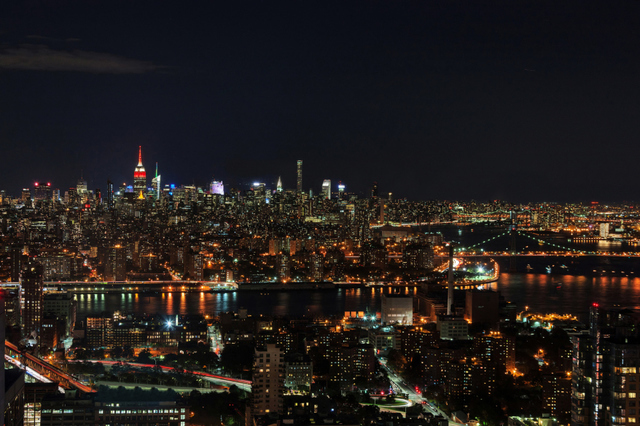 The Apple Store, Whole Foods 365, the Brooklyn Academy of Music and the Barclays Center are minutes away. 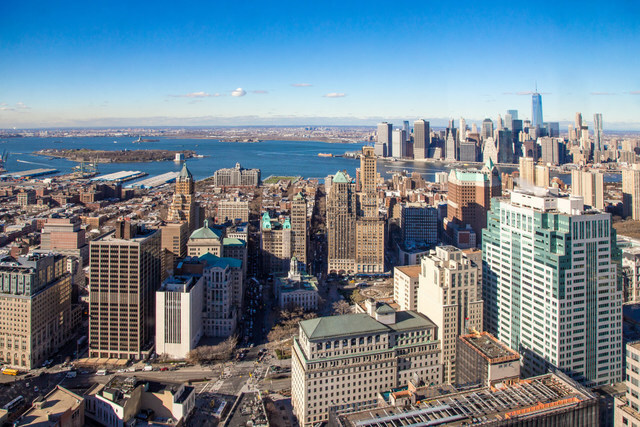 Short stroll to Brooklyn Heights, Fort Greene, Boerum Hill, Cobble Hill and DUMBO. The best subway access is at your doorstep with A, C, B, Q, R, F, G, 2, 3, 4 & 5 trains and LIRR for a fast commute anywhere in and out of the city. This is truly the most convenient living that Brooklyn has to offer!